I have a couple of questions regarding this service that weren't brought up on the video. 1) Will they have overseas servers (as I live in Australia and the lag would be in the 100's of milliseconds at best if the server is in the US)? This is just the very first examination of the service. I'll pass your questions on. Regarding internet speed, Nvidia recommends 50Mbit speed for 1080p, 20Mbit for 720p, and at least 10Mbit to work at all. For their gaming service they do have one Asia-Pacific server AFAIK in addition to several in the US and EU, No doubt Mike will get the answers to the rest of your questions but at least you won't have to depend on connection to a US server (assuming I'm correct). If it's similar to their GeForce gaming on the Shield I think you have the opportunity to check the latency before committing to the service. Why does this remind me of OnLive , from what now seems like so long ago. "To participate in the beta, you need a compatible Mac computer with a 25 Mbps Internet connection, and to be located in the continental United States or Canada. " So initially, it seems that there is no viable service outside the U.S. or Canada. And very little within the USA, since most of our internet infrastructure is still pretty poor, unless you live in the very few places with fiber. This is sick, that high quality video latency can even get this low over the internet.. I'm wondering what the backend looks like. Like if there's an equal amount of gaming PC's that there are users, packed in a LAN party server room, lol.. Or if it's a crowd leasing grid of sertified machines and network specs. Perhaps one can find out about the details on the service site. Impressive nonetheless. I too thought this as well but interesting news nonetheless. I have access to the beta - but I took one look at the available games and there was nothing I had any interest in playing. One of the difficulties is making this profitable. The demand isn't constant throughout the day, it will be almost zero during the working part of the day and then high demand for 4-6 hours and then zero overnight but they need to keep the systems operating all the time. These services all have long beta phases to figure out what the demand is going to be and if it can be sustained financially. 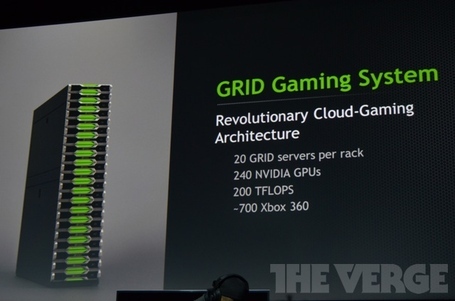 NVidia has an advantage in being able to use their grid for other tasks like computing so they can make money that way too. Their cloud gaming prices are high at around $0.80 per hour but other services have run out of money by pricing too low. OnLive went bankrupt years ago, Sony bought both them and Gakai and currently run Playstation Now. NVidia rebranded to Geforce Now after Sony launched their Playstation Now service. This service applies to PC users, Steam has over 125m active users. Not all of them need the power to play higher-end games and the ones that do typically already have a setup capable of it, they haven't been waiting for a solution. The appeal would mostly be for whatever portion of low-end/laptop users want to play high-end titles. 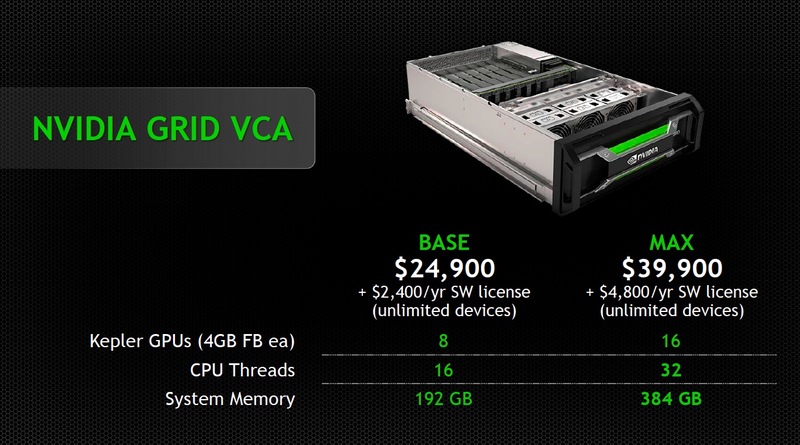 If NVidia targets 10 million gamers and each server blade can handle 16 users and there are 20 blades per rack, they'd need 30k racks e.g 10k per data center. They wouldn't need to target 10m concurrent, Steam peaks at 14m. They can build a 1060 for ~$150, that would be a $1.5b cost for all the gamers and as GPUs improve in performance, they can satisfy more gamers with fewer GPUs. To make a profit at $0.8/hour, they'd need every one of 10m users to play 187 hours of games. Average games only take 10-20 hours each, a handful can take a long time. It's easy to see why the other companies went out of business. NVidia is better suited for this than the other services because they make the GPUs, the other services had to buy the GPUs from AMD/NVidia and NVidia has its own money to invest in it. These services will likely only ever be a small portion of the overall games industry but it's a great option to have for low-end Mac users because it saves having to install Bootcamp. Using it for an occasional demanding game would be ideal. Mac ports are typically more expensive anyway so this way you can get a game as soon as it comes out or in a sale and just add $15-20 to the price to be able to play it under macOS without putting any load on the hardware at all. 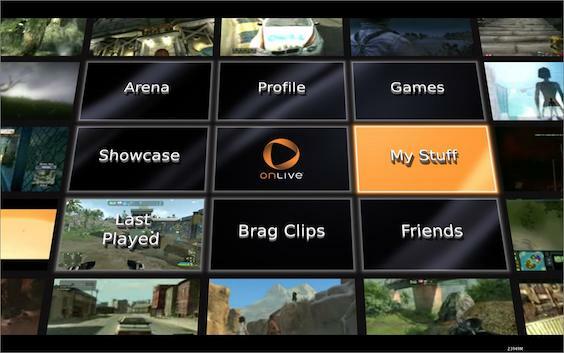 I remember OnLive. This is still awesome, glad this idea is being done right. One of the difficulties is making this profitable. The demand isn't constant throughout the day, it will be almost zero during the working part of the day and then high demand for 4-6 hours and then zero overnight but they need to keep the systems operating all the time. I'd think they could rent out that power during the day to pro users who might want the rendering capabilities for 3D or video effect rendering, etc. I'm not sure why the video says 200fps on a 12" MacBook (aside from click-bait). 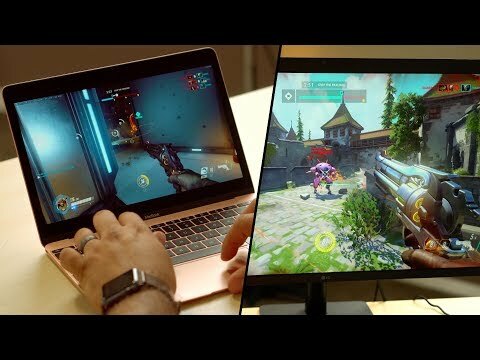 There's no way you're going to get 200fps to that MacBook. Interesting, though, for some gaming for people who aren't fanatical about it... if they live in the right places or this services becomes distributed enough.